OPPO F9 x Shiseido Starry Purple gift box will exclusively selling at Lazada online store at 12pm, starting 3rd October 2018 onwards while stock last. Anyone that purchased the limited edition gift box will be receiving a glittery OPPO F9 Starry Purple, Shiseido Rouge Rouge lipstick in Primrose Sun (RS419) worth RM108 and a flash makeup service card that allows customers to experience a makeup service. In associate with the OPPO F9 Starry Purple, Shiseido has specially designed two choices of make up, either Romantic Daily Look or Chic and Cool Night look at certain Shiseido outlets. 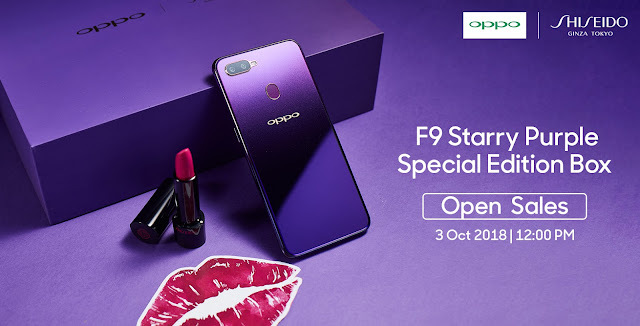 Having the same vision towards fashion and style, both OPPO F9 Starry Purple and Shiseido lipsticks complement each other, letting customers to glow with confidence. For more information about OPPO F9 , here | OPPO F9 Starry Purple Ambassador, here.